Question: What is better than sharing an evening with family, friends and fellow Oklahomans? Answer: Nothing, and it’s easy to say that Oklahoma Born and Brewed is all of those things and more. For those that have never attended, or even for those that have joined us the past three years, Oklahoma Born and Brewed is a night like no other. The theme of the event every year is Oklahoma: from the food selection, flower arrangements, to the breweries, the event lives up to the theme and features the state’s best of the best. The feature of the event is you guessed it, the breweries. With the help of the Craft Brewers Association of Oklahoma we secure the best breweries, currently brewing or in progress, to feature at the event. This year we’re excited to have 14 breweries joining us including (405) Brewing Co., Angry Scotsman Brewing, Anthem Brewing, Bricktown Brewery, Cabin Boys Brewery, Coop Ale Works, Iron Monk Brewing, Marshall Brewing, OK Cider Co., Prairie Artisan Ales, Roughtail Brewing Co., Stonecloud Brewing Co., Twisted Spike and Vanessa House Beer Co. When checking in you’ll received a tasting booklet where you’ll be able to jot down your favorite pours. Trust me, you’ll find one (or two) beers from each brewery that will be your new favorites. You’ll also find live music from the Bread and Butter Band, a local four-piece quartet that rivals any bluegrass, honky tonk, toe tapping band you’ve ever heard. Additionally, attendee favorites have become the gift card pull where attendees can purchase a gift card at random valued at $20 and up as well as a beer raffle where two lucky attendees could go home with bookoos of beer and a growler and cooler from Simple Modern. 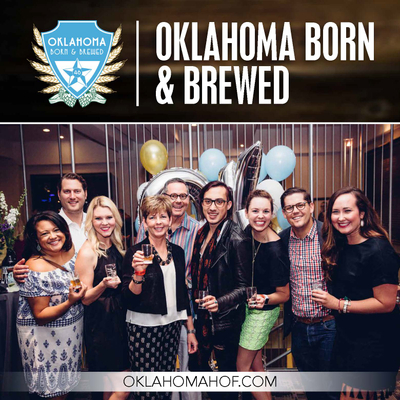 To sum it all up, Friday, August 17 your plans should be to attend Oklahoma Born and Brewed, a night you won’t forget spent with those just as passionate about Oklahoma as you are. Be sure to purchase a sponsorship or your tickets before the event sells out!